Healesville Community Bank has furthered its support for the Healesville CoRE project to become a net-zero emission town by 2027. 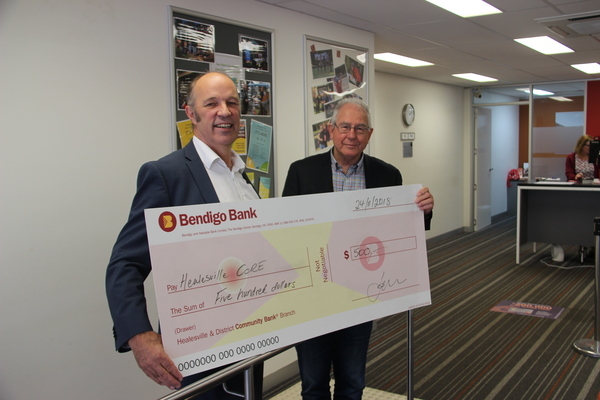 On Thursday 14 February Community Bank Chairman Bruce Argyle presented Jeff Barlow, President of Healesville CoRE, with a donation of $500 in support of the groups work. Jeff Barlow welcomed the donation, and a similar one from Permaculture Yarra Valley, that come on the eve of the launch of the Healesville CoRE Solar and Battery Offer on Monday 25 February. 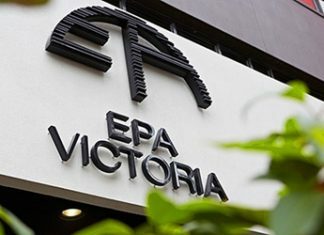 Bruce Argyle said that supporting Healesville to increase it’s renewable energy project fits in well with the banks philosophies and practices in this area. “In 2017 when we first heard about the concept of Healesville CoRE and the goal of becoming a net zero emissions town we felt strongly that this was something that was pretty important. We also believed that the community would be happy with us supporting the project. “We made a commitment from board level down that we wanted to do everything we could reasonably do to support CoRE in their goal of making Healesville a net zero emissions town by 2027. “At its heart, the bank is about community and if the community is saying loud and clear we need to be doing more in this space then we will. Renewable energy and climate change needs to be taken seriously and that’s why we feel a strong commitment to do something about it. The Community Bank offers special deals to assist residents and businesses with competitive loans for solar panels, batteries and solar hot water. There are also significant government grants that will be available to homeowners, landlords and tenants.